Carmen Bartlett, (center) Regional Manager for JN Money Services (JNMS) USA South East Region accepts a Proclamation from Broward County Commissioner, Dale Holness (left) as her husband, Edmund, accompanies her at the lectern. The Proclamation was issued on April 7, during a dinner at the Ritz Carlton Fort Lauderdale in Florida to honor Bartlett who retired at the end of March after serving as Regional Manager for JNMS USA Southeast for 21 years. 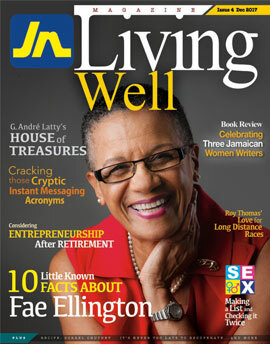 She served in various capacities with The Jamaica National Group for a total of 45 years. Broward County, Florida, in the United States of America (USA) issued a proclamation honouring Carmen Bartlett, retired JN Money Services (JNMS) regional manager, for her service to the Caribbean Diaspora in Florida and the remittance company. 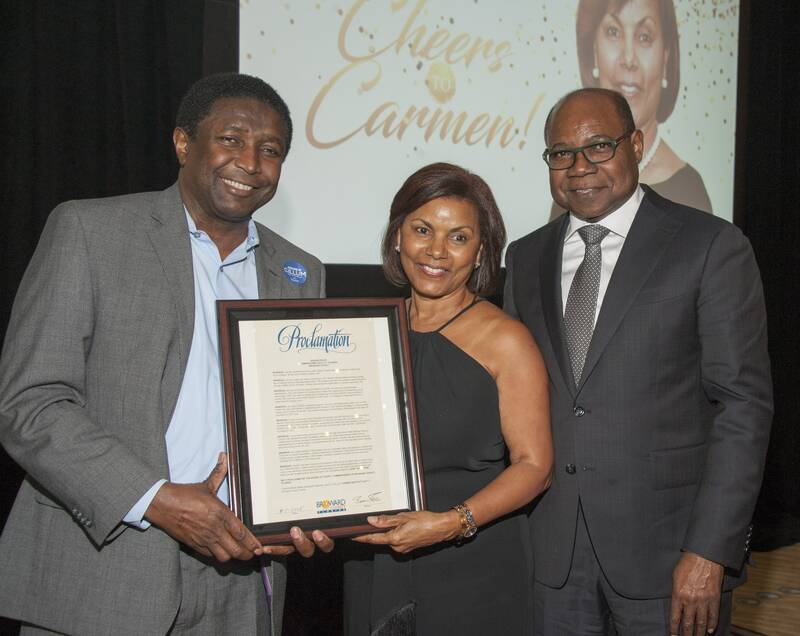 Under the Proclamation, Saturday April 7 was celebrated as “Carmen Bartlett Day” in Broward County, to commemorate her contribution in the community. Dale Holness, Broward County Commissioner, issued the Proclamation at a dinner honouring Mrs Bartlett at the Ritz-Carlton Fort Lauderdale in Florida on Saturday April 7. A proclamation is a formal public statement issued in praise and celebration. Mrs Bartlett retired at the end of March 2018, after serving 45 years with The Jamaica National Group. She spent 21 years during that period, as Regional Manager of JNMS USA, South East. The Commissioner emphasized that Mrs Bartlett extended her time to various community and charitable organizations; and established the Lisa Bartlett Foundation, in honour of her late daughter, which continues to make contributions to various charities in Jamaica. “For the past 20 years she has been actively involved with The Cystic Fibrosis Foundation, a promise she made to her late daughter, Lisa Simone Bartlett. Mrs Bartlett continues to make her contribution through her involvement with the Foundation “Great Strides Walk,” for which she and her team were able to raise in excess of US$5,000 annually,” he stated. Earlier, State Representative Barrington Russell also paid tribute to Mrs Bartlett for her work in the Caribbean community in Florida and Jamaica. Mr Earl Jarrett, Chief Executive Officer of The Jamaica National Group, likened Mrs. Bartlett to United States Civil Rights activist, Rosa Parks. “Mrs Bartlett’s contribution to the Jamaica National Group, and by extension Jamaica, has been nothing short of seismic. She reminds me of Rosa Parks, who through her actions and activism changed the face of America. Carmen Bartlett is Jamaica National’s Rosa Parks. Her personality could not be described as tough or cut out for business. However, she found her way by developing a strong network of friends, who worked to help Carmen achieve her goals,” he explained. Mr Horace Hines, general manager of JNMS, hailed Mrs Bartlett for her dedication to the remittance company, and commended her for building the JN Money brand in Florida. In her response, Mrs. Bartlett said that being a part of the Jamaica National family had enabled her to excel. “I will be forever grateful for the opportunity that I was afforded to grow and become the person that I am today. Most of all, I appreciate the fact that I was allowed to do my best at all times. That provided me with a platform on which I could excel and achieve,” she said.